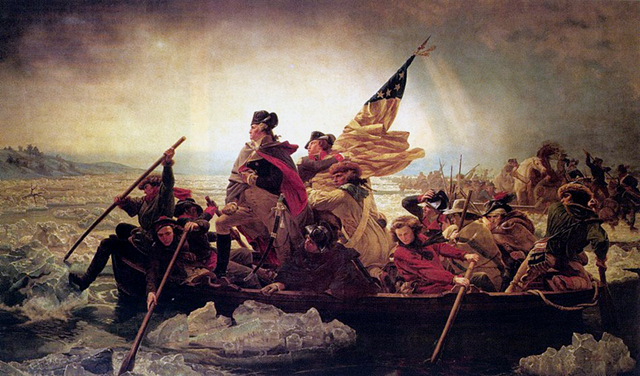 I came across this picture, of George Washington crossing the Delaware, quite by accident the other day. I didn’t do anything with it; after all, what do you do with a picture like this? Then it came to me very early this morning. This is a Christmas picture; an intensely important Christmas picture, if you’re an American. At least it should be. This very special Christmas Picture is very different from most Christmas pictures you see, as there are no Christian icons, no Santa Claus, no elves and no Christmas trees. It is, however, Christmas. Although most Americans have a vague awareness of George Washington crossing the Delaware, their consciousness is that of a story from folklore, rather than something that really happened. But it did really happen. Not only did it really happen, it happened on a bitterly cold, ice covered Christmas morning more than 200 years ago. George Washington, along with hundreds of volunteers, crossed the Delaware River, many in tattered clothes, during the American Revolution to insure the establishment of these United States. The move was heralded for centuries as a watershed moment in our Revolution. So I have published this picture, a Christmas picture, for all Americans. So we all remember. I ask all Americans to remember that the men in this picture, Washington included, were willing to sacrifice everything for the good of the country they were fighting to establish. I also ask you to compare the men in this photo, our forefathers, to those who purport to lead our country now. Compare to Nancy Pelosi, Speaker of the House of Representatives, who just two weeks ago headed to Copenhagen with two – one was apparently not adequate – private jets for an historic convention on global warming. Comrade Pelosi apologized for America and tried to give away hundreds of billions of American taxpayer dollars to the rest of the world because of the mess we’ve made. And I thought the $30,000 taxpayer dollars she spent this year outfitting her office with fresh flowers was bad. Compare to Harry Reid, who has played Lets Make A Deal for the last several weeks in an effort to pass socialized medicine in the Senate. At least Harry knew what it took to motivate his fellow democratic Senators: bribes, pay-outs and the most massive earmarks in history. Compare to Senator Ben Nelson, who would never vote for the healthcare bill because of publicly funded abortions; unless you pay him $100 million. Compare to Senator Mary Landrieu, who was completely on-board with the healthcare bill, especially since she procured $30 billion in special entitlements for Louisiana. And, let’s not forget Joe Lieberman, that bastion of integrity from Connecticut who wouldn’t vote for the bill, until he was paid off. Compare all of our leaders from 2009 to those men who were willing to sacrifice everything on December 25, 1776. In 2009, the most outrageous leader of them all, the man who promised transparency in government and legislation free from lobbyists and earmarks, is vacationing for ten days in Hawaii. That’s a great deal different from George Washington’s Christmas. Oh, and please don’t forget that the events depicted in this famous Christmas painting, took place shortly after a Tea Party.